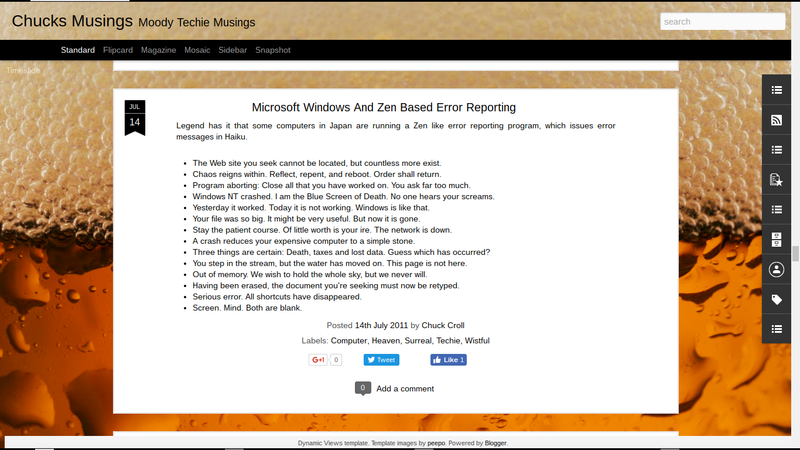 I've been providing advice, in Blogger Help Forum: Something Is Broken, for various blog owners whose readers cannot comment, for some time. Many problems which involve commenting start with content filters. Generally, the problem is simply caused by overly optimistic cookie and script filtering. Resolution of the problem may involve changing comment form type, for blogs with certain reader populations. Dynamic templates appear to present other challenges with commenting. This week, I tried posting test comments in various blogs that use the dynamic templates, as a default view. There are several possible challenges here. Main page view may not inform the casual reader that comments are permitted. Local rendering of blog content may be a problem, on some computers. The mechanics of the dynamic template post overlay may cause confusion. Different dynamic views may provide more or less of a challenge. Main page view, in the dynamic template, may confuse the reader. Main page view, for blogs not using the dynamic templates, will provide a link below each post, "nn Comments" ("nn" stating the current comment count). With the reader clicking on the link, the individual post page will be presented, with the browser positioned at the top of the embedded form below the post. The reader will not be immediately aware of the display change - but may simply see the comment form, displayed before his eyes. The dynamic template equivalent of main page view will show just a snippet of the post, or the complete post - but with no mention of Comments, anywhere. To have any chance of posting a comment, the reader must know to click on the post, and view the post in the overlay. With the individual post visible in the overlay, the reader must know to scroll to the very bottom of the overlay. With the design of the single post overlay, this involves explicitly scrolling to the very bottom of the screen - again, not an obvious procedure. At the very bottom, one will find the simple caption. Clicking on the caption, and / or scrolling again, the reader finds the embedded comment form. With the Classic Dynamic View selected (either by the blog owner, or by the reader), there is no overlay used. Even so, there is another possibility for confusion. When there are no comments published to a given post, one will see the link "0 comments" or "Add a comment". Clicking on the link, one will scroll to the very top of the comment form. Depending upon the size of the display, the bulk of the comment form will remain invisible - and again, the need to scroll just a bit farther won't be immediately apparent - and the would be commenter will again go away, in confusion. Since the dynamic template is being rendered in real time by the readers computer, each display may not refresh, immediately. If the readers computer is busy, or low on resources, the display may not be immediately updated. There is no indicator in the dynamic view, that indicates to the reader that the display has a pending update. The reader may not observe the delay - and may casually think that there is no comment form available for the page or post. After entering the comment into the box, selecting the appropriate authentication, and hitting the "Post Comment" button, the reader will be presented with the CAPTCHA form. Options for the second and third steps will vary, at the pleasure of the blog owner. Again, depending upon how busy the computer is, the CAPTCHA form may be presented immediately - or may require that the reader again scroll to the bottom. If, during any of the above steps, the readers computer not rendering the next display promptly, the reader may become confused and close the overlay. The next step will involve the reader communicating with the blog owner (when the owner is fortunate enough). I wanted to leave you a comment, but your blog doesn't accept comments. What the &*^^% are you doing with the blog, this month? These effects may be more obvious with views that display the complete post in an overlay, and with longer posts. The Classic and Sidebar views display the complete posts in a more conventional style - and the comment form is more visible. With shorter posts, that fit within the browser window, the comment form is more visible. Look at one post, from my Musings blog. 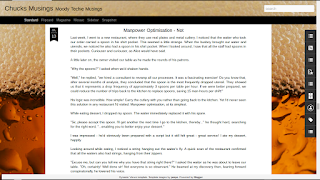 My blog, with a short post, displayed using Standard view. 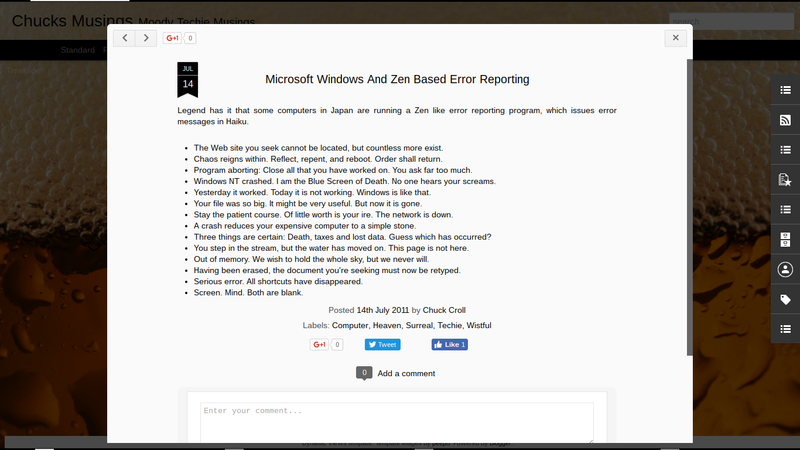 My blog, with a short post, displayed using Classic view. My blog, with a slightly longer post. Not all dynamic views will present the "Add a comment" link, as easily displayed for the readers, for all posts on all blogs. 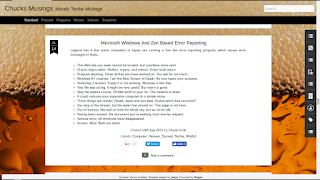 And once again, we have another issue for Blogger Help Forum: Something Is Broken. My readers cannot comment on my blog! And, another mystery will fill the forums. Owners of some #Blogger blogs may observe that reader commenting is not as active, having recently published to a dynamic template. There are a variety of reasons for the change in activity. Yeah, I wan't the old comment form back! I've asked for help but nothing yet. I think it;s ridiculous, instead of taking to someone who's actually from Google, I have to wait and pray that someone bothers to reply. I have no comment box at all and considering closing my blog due to this. You operate on a personal clock, that's a bit different from some of us. At any rate, I located your forum post (which is not always easy to do, for every forum poster), and gave you my initial suggestion. Thanks for getting back to me guys - I'll can the captcha and change to the full page comment form and see if it makes a difference - I'll let you know how it goes.